The Dutch government recently released its 2014 spend data to the public as part of an initiative to further increase the availability of Open Data. The datasets provide further information on the suppliers which each Ministry dealt with per purchase category, allowing visual deep dives into the inner workings of the government’s supplier networks. What does each Ministry’s supplier base look like? Network analytics provides an answer. Open Data is a hot topic in the Netherlands these days. The Dutch Minister of the Interior and Kingdom Relations, Ronald Plasterk, aims to stimulate the re-use of open government data by businesses and individuals to further enhance the societal impact of these data sources. As part of this initiative, the Dutch government’s Open Data portal (https://data.overheid.nl/) was recently updated with a wide variety of datasets – including overviews of expenditures and related suppliers per Ministry and purchase category. According to a statement released when the data was made public, all spend datasets combined cover about 10 billion euros of expenditures across tens of thousands of suppliers. The datasets do not provide exact spend figures – instead, expenditures are listed as 13 relatively broad ranges. The smallest range covers anything between 0 and 10.000 euros, while the largest range holds all expenditures larger than 150 million euros. Also, not all expenditures are included in the datasets. External time hire (interim managers, consultants, etc.) is not included, and neither is any data which breaks the privacy or confidentiality of specific suppliers. Despite these limitations, the data is still quite rich, aggregating to over 66,000 records of suppliers, purchase categories and expenditure ranges ready for further analysis. The data is also quite ‘clean': supplier names are matched with the Dutch Chamber of Commerce’s databases, and company subsidiaries are merged with their parent companies already. In the end, this drills down to 31,567 unique suppliers across 11 Ministries, 8 main categories and 63 sub-categories. Traditional analysis of spend data might focus on providing drill-downs of data based on various charts and tables. In the end, most of these analyses are based on counts and sums of suppliers, categories and associated expenditures. This then allows analysts to, for example, gain insight into the importance of suppliers within each category, and locate spend consolidation opportunities based on spend totals within categories. A network-based perspective on spend data focuses on the actual relationships between data points – in this case, between suppliers and the spend categories they are associated with. This opens up a new host of insights based on visual analysis of the same data: which suppliers are shared across categories? How does the distribution of small and large suppliers look from a visual point of view? Squares are spend categories; circles are suppliers. The larger a node, the more expenditures are associated with it. Colors are clusters of suppliers and categories based on the density of connections within and between them. Category 1150 at the left shows all suppliers in Learning & Development – 69 in total, with overall spend between 250.000 and 500.000 euros. At the right, we see some smaller categories relating to ‘Gifts not for own personnel’ and ‘Representation for own personnel’, with the latter one mostly made up of expenditures at restaurants and bakeries. Judging from the sheer amount of suppliers active within and across categories, it may be worthwhile for this Ministry to consider consolidation and thereby reduce its expenditures along the way. This may especially prove worthwhile for suppliers that do business across multiple categories, who probably deal with various buyers in the Ministry’s organization at the same time. In one view, the above visual shows all purchase categories and key suppliers across all ministries. Many of the Dutch government’s largest suppliers are infrastructure & construction companies hired by the Ministry of Infrastructure and the Environment – 32 of the top 50 suppliers in terms of spend do business with that Ministry. 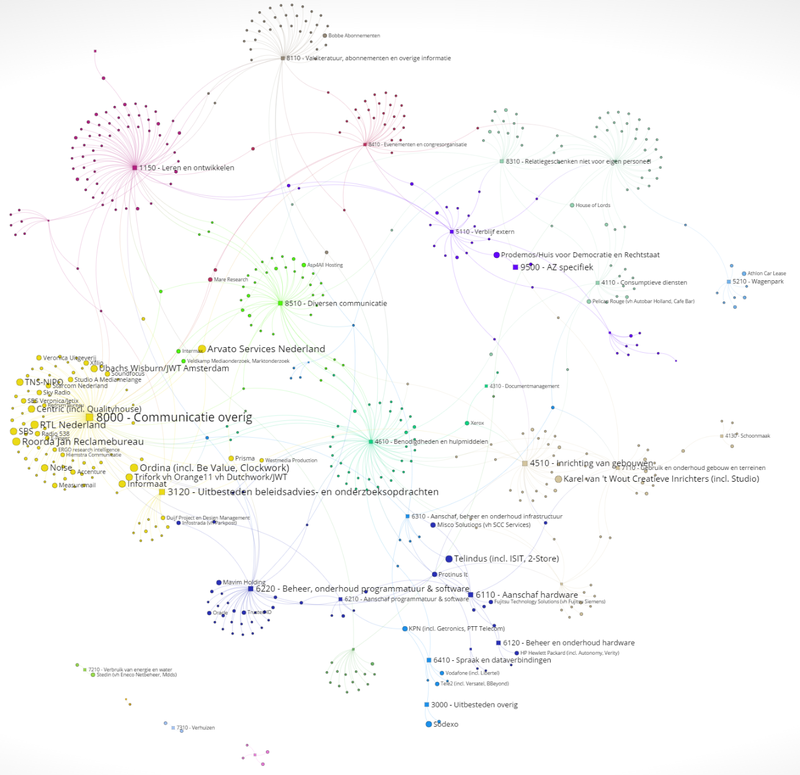 At the bottom of the network, we see PostNL, the Netherlands’ largest mail company – the Ministry of Finance had expenditures between 100 and 150 million with them in 2014, reflecting the significant expenses of the Tax & Customs Administration in that area. All the way at the right, we see a category ‘VWS specifiek’, which deals with specific expenses by the Ministry of Health, Welfare and Sport. One of the key suppliers here is GlaxoSmithKline with a spend between 25 and 50 million. A quick Google search shows that this is probably related to large-scale buying of vaccinations. 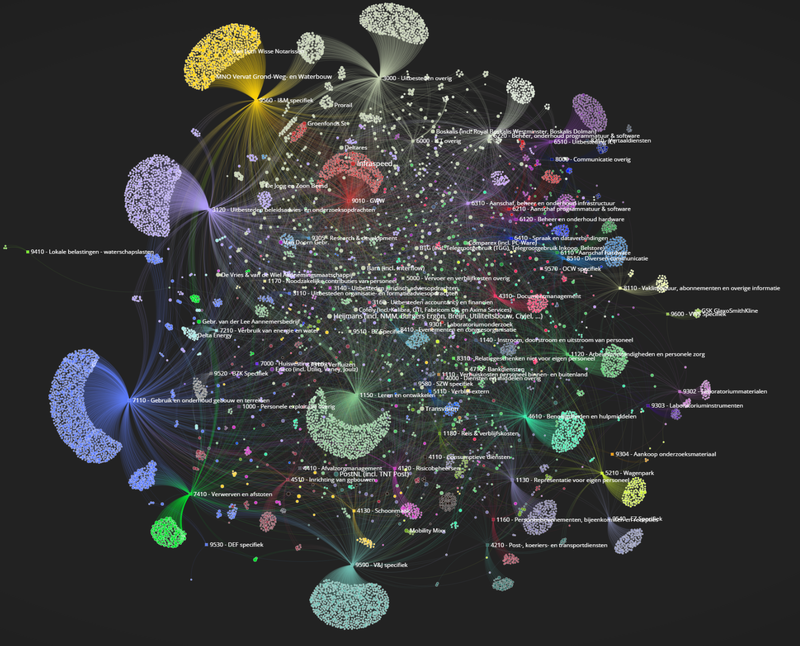 Network visualizations such as the above can be a great complement to more traditional types of data analysis. 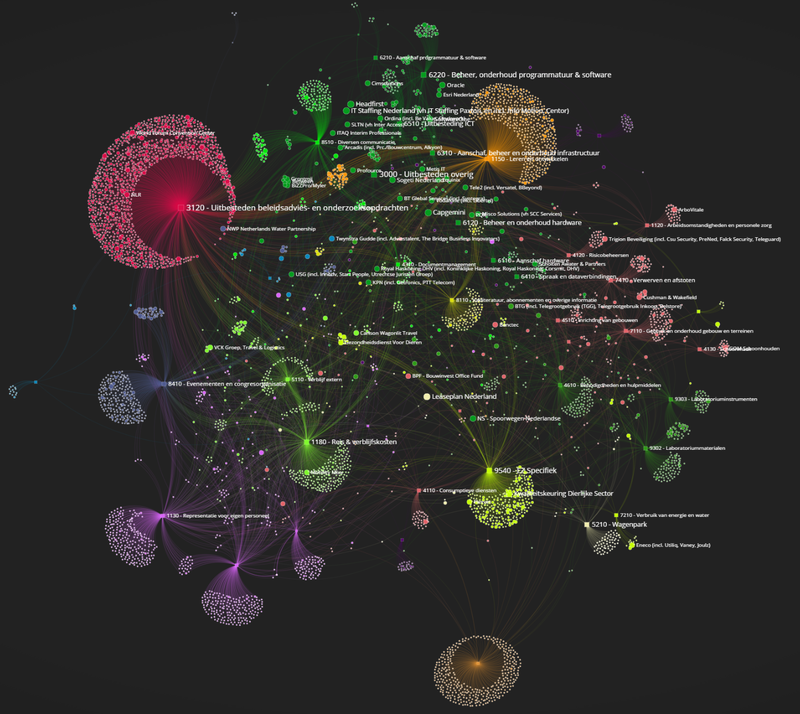 They allow to quickly sift through large datasets, determine clusters of related entities, and visually locate important nodes and connections. In the context of the public spend data analyzed here, this allows the visual identification of potential consolidation opportunities, which has the potential to lead to significant savings. The publication of this dataset by the Dutch government is a great step forward in the Open Data domain – let’s hope we’ll get many more of these large datasets in the future.